Think of the Impressions Panel Bed as your blank canvas and bring it to life with your favorite colors, accessories and bedding. With a gorgeous finish that blends well with a variety of decorating styles, this Panel Bed offers timeless style.Pictured with Optional Trundle/Storage Drawer. This bed can be used with a mattress and a box spring or with a mattress without a box spring. 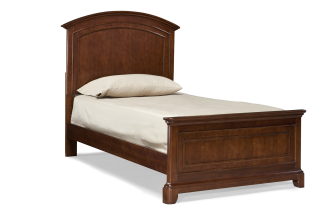 The Bed offers 2 rail height positions with Slats 9" and 15" from the floor.